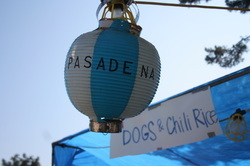 Click on the picture to get to our Obon page. Thanks for a very successful Obon, especially to the BRUINS Organization! It takes the effort of many people to make any event successful. Thanks to everyone who came out to help set-up, take-down, work in a booth, sell tickets, prepare and sell food, or just coming! We had lots of dancers both night! Obon honors the memory of relatives and friends who have passed away. Obon Family Service will be held on Sunday, July 7th at 10:00 am in conjunction with the monthly memorial service. Guest speaker will be Rev. Kenjun Kawawata from West Covina Honganji Buddhist Temple.Hatsubon Service will be held for families that have lost a loved one since the last obon on Saturday, July 13th at 3:00. Food booths served BBQ chicken teriyaki, chow mein, sushi, and snow cones. A few game booths will help entertain the youngsters. Festivities begin at 4:00 and end at 9:00 on Saturday and 8:30 on Sunday. Each evening, dancers from around the Southland gathered around the yagura and danced the traditional Obon Odori (dances). Dancing is scheduled to begin at 6:30 pm each evening. Obon odori is to dance for joy. Everyone is invited to join in to "just dance" and be accepted as we are. Obon Dance Practices will be held on Tuesday and Thursday evenings from 7:00-8:00PM in the temple parking lot beginning on June 19th. Taiko Performances are scheduled each evening during the dancing break (around 7:00 PM). Saturday will feature Matsuri Taiko. Sunday will feature Chikara Taiko from Centenary Methodist Church. For more information about the Obon Religious events, contact Reverend Rosenthal. For information regarding the Obon Festivities, contact Jeannie Toshima. To see a total listing of all obon festivals, go to Japanese-City.com. This site also has practice schedules also. Beginning on Tuesday June 18th at 7:00 - 8:00 pm we will have Obon Dance Practices. Practices will be every Tuesday and Thursday evenings (except for July 4th) until the Obon Festival on July 13 & 14. Sandy Watson and Julie Toyama will be our wonderful odori sensei again this year. Put this on your calendar to join us!